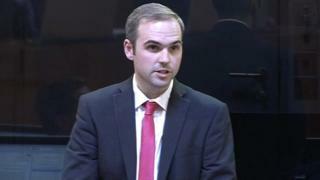 Image caption Steffan Lewis says family, friends and colleagues "are providing me with incredible support"
A Plaid Cymru AM has revealed he is seriously ill with cancer. Steffan Lewis, the party's Brexit spokesman, said he received the "devastating" news following a CT scan. "Although the precise nature of the cancer is as yet unknown, it is at an advanced stage," he said. Mr Lewis, the youngest AM at 33, said he and his family were "still coming to terms with this news" but added that he was "determined to fight this illness and to come out the other side". "My family, friends and colleagues are providing me with incredible support and are with me at every step of this journey," he said, confirming that the scan had shown stage four cancer. "I cannot thank staff at the Royal Gwent Hospital [in Newport] enough for the care they are providing me. "I will be undergoing further tests in the coming days and a treatment plan will be put together for me. "I know I am in the best possible hands to defeat this illness and I am determined to do so." Mr Lewis asked "for the space my family and I need as I undergo treatment". From Blackwood, Caerphilly county, he was elected as a regional AM for South Wales East in May 2016. Married with a young son, he is Plaid's spokesman on external and constitutional affairs, including Brexit and criminal justice.